Cheetah vs. Leopard: What's the Difference? The Dilemma: You want to be a cheetah for Halloween. You do NOT want to be confused for a leopard. People You Can Impress: Biologists, African tribes. The Quick Trick: It's all in the spots. Cheetahs have simple black spots, while leopards have a more complex pattern. 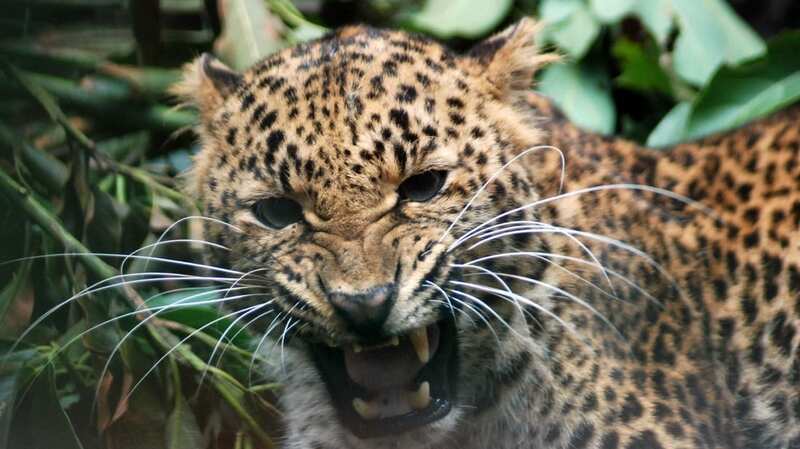 Both cats can be found across Africa, the Arabian Peninsula and southern Asia, and when encountered, both really just look like a scary mass of spots and teeth. When viewed from a safe vantage point, though, there are a number of physical and behavioral characteristics that set them apart. A cheetah, at left, and a leopard. Cheetahs have solid black round/oval spots and black "tear lines" that run from the corner of their eyes down the sides of their nose to their mouth (the lines keep sunlight out of the cheetahs' eyes while hunting). They're also lankier than rest of the big cats and have smaller jaws and longer tails. They hunt during the day and rely on bursts of speed (up to 75mph over short distances). When walking and running, they pace, moving their two left legs and then their two right legs. Unlike leopards and other big cats, they can purr while they inhale, but can't roar. Leopards have more complex spotting pattern of clusters of black and brown spots which look like roses, called rosettes. This pattern simulates shifting plants and shadows, providing camoflage as the leopards stalk their prey from tall grass and underbrush. Leopards in eastern Africa have circular rosettes, while their southern African brethren have square rosettes. Leopards are also noticeably bulkier looking than cheetahs. They're not built for speed, but surprise attacks. The extra strength helps leopards drag their prey up trees, where hide the kill to feed on at their leisure. Leopards walk using their legs in diagonal pairs (i.e. left front and right back leg, then right front and left back leg). Like the rest of the big cats, leopards can roar but can't purr except while they're exhaling.